Updated the download link, added an 8th, 9th and 10th maps and tweaked doomguy a bit. He's now much more aggressive and avoids melee / is no longer blocked by it. BFG wrote: there was an old skin on the emproium website that had a really good Imp hud face, is that the one you're using? EDIT: I tracked these down and they're great! much better than mine, I think I will use them. 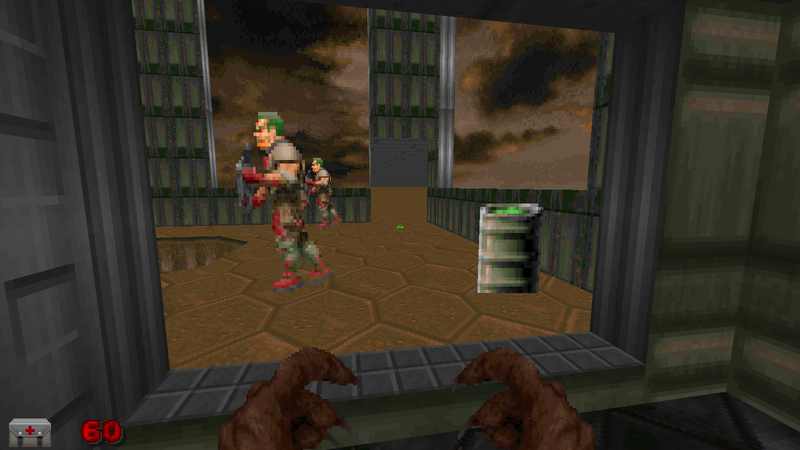 Not at this stage, as it requires imps to be replaced with player starts, and all the doors opened, and doomguys added with patrol points. You can convert maps to work with this, but it takes about 10 - 20 minutes per map. I'd love to work out a purely ACS / Decorate way to do this, but at this stage I dont know how that would work. i also have to point out that you have to need the Auto equip weapons to use the weapons as the imp? and also that The rocket launcher the plasma rifle and the bfg are not affected by the imp so if he grabs it he can hold them as long as he wants? I did look at this one, but there wasn't a full set so I just made my own from the basic imp sprites and photoshop. Oh by the way osj, I ended up using the visored doomguy mugshot in my mars mod, it looks great! Redead-ITA wrote: i also have to point out that you have to need the Auto equip weapons to use the weapons as the imp? I think I will change it so the imp can switch back to weapons if he wants, otherwise after 15 or so maps you wont be able to use weapons at all! EDIT: Ok I've updated the OP link, you can now change weapons at will, and return to weapons once you've changed away. Also cleaned up a few maps and minor issues. Which issues in particular? I occasionally get some error messages in console for some of the Doom1 maps, but I haven't actually seen anything amiss..
Good spotting, thanks. I fixed an area on map06 that was causing a lot of issues, and I need to drag a few maps so the ceiling/floor textures line up with the geometry. EDIT: thanks again for the texture spotting, I fixed the errors I could find (hopefully all of them!) and added an 11th map! Added 4 more maps, now up to 15 in total! 1) Claim a map from the overall map document: Just write CLAIMED in the CLAIMED/FINISHED column so I know I dont have to do it myself! Note that the 3 or 4 maps after the currently finished ones will be the ones I'm doing next, so best not to claim them... I may already be working on them! 2) Open the selected map in your editor of choice (I use GZDoomBuilder) copy the lot, including sprites and actors. Change the map number to the IMPatience map number you're going to be making (check the google document above!) Make sure you're using the doom2 wad. The folder isn't important here... stay out of my users/public/ISO folder! 4) Paste the doom map into the new map you just created, make sure the teleporter and platform textures line up with the geometry. Now save the map into the IMPatience wad. It shouldn't ask you to replace anything, as you are making a new map (hopefully!) Your map should now be part of the IMPatience wad. You can check it by saving and reopening, your map should show up. 5) go around and open up most of the doors, be creative in which you want to leave closed and which secrets to expose. Dont worry if doors are key doors, open them any way! you want the players and monsters to be able to move throughout the level with impunity (no pun imptended) At this stage I also brighten the level especially if it has dark areas. I usually brighten about 32 units of brightness (4 clicks of "cntl+mousewheel up" while the sector is selected). Imps usually have darkvision and this is the intention here, no need for them to be stumbling around in the dark. 7) Select the 4 player starts, and give them an argument 0 of 1. Now place the player 1 start in the position of an imp (if there aren't any imps in the map, just make something up!) Delete the imp where the player1 start is. The player replaces this imp. With the other 3 player starts, place them around in other imp positions, and uncheck those imps on "co op" mode, so that the players 2 through 4 dont telefrag an imp when the map starts. Make sure the player starts are present on all skill levels, and disabled for deathmatch. You should also place a Player1 start with an argument 0 of 0 for testing. 8) Place a doomguy / marine where the original player starts were. Use one of the marines from the Decorate actors (at the bottom of the list) as these are my custom doomguys. Usually he starts as a Plasma marine by map 15, but he could be a rocket marine, or a fast plasma marine if you find he's getting killed too much. Give him a tag, and set his special to: 80 (Script Execute) and to run script 3. Make sure he is set to be there under all difficulty levels. 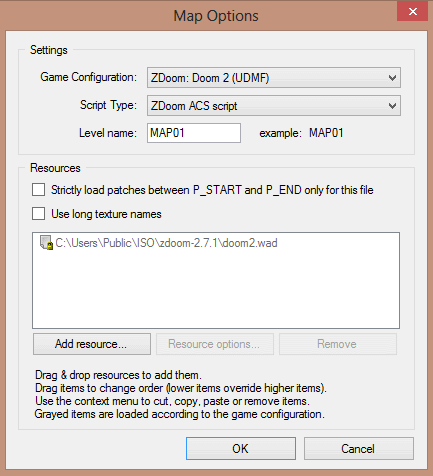 11) Place a patrol point (under the zdoom actors) with a new tag. This will be the first patrol point doomguy runs to. Make sure this point has a clear line of movement to where doomguy spawns. Set the patrol points "Next Patrol Point Tag" in the Action/Tag/Misc tab to be the next number in sequence (so If the patrol point has a tag of 12, set this number to be 13) Make sure the patrol points are set to be present on all skill levels. 12)Plot out a course for doomguy to follow, repeating step 11. place a new patrol point, give it a new tag, and enter the "next patrol point tag". repeat until you have a full course for doomguy to follow, all the way to the exit of the level. 13) Check along doomguys path for any lines marked "block monsters" disable the block monsters flag so doomguy can pass. You may also want to enable some block monster lines along cliff edges so doomguy doesn't fall off and stays on track. 14) Add some walk over trigger lines for any platforms that are necessary to traverse the level. You can leave some inactive, but any right in the middle should be able to be triggered. Make the lines activated by monsters or the player walking over, and make them repeatable. Most platforms are already tagged from the original doom maps, so just check the platforms tag. 17) You're done! Playtest and make sure it works. You can remove the delay(150) from the last part of the last script if you need doomguy to heal more regularly. You can also decrease the other delays in the last script to speed up the healing process. Experiment and try to get it to a point that doomguy can easily traverse the map, killing all the monsters. It should mostly be the player that stands between doomguy and success. Last edited by HexenMapper on Mon May 30, 2016 8:27 am, edited 6 times in total. Why don't you just put all the doom.wad textures in the impatience wad so you don't have to replace textures on doom 1 maps? I believe that's technically copyright infringement and Id Software doesn't like it. I will check out adding doom1 textures, although there aren't usually many to replace.